But what will I get at the end of it? YOU WILL BE UNSTUCK AND YOU WILL BE MOVING! "WHAT IF I MISS A MODULE?" "WHAT IF I WILL STRUGGLE TO MAKE THE TIME FOR THIS?" A KEY PART OF THIS COURSE IS ABOUT CHANGING YOUR RELATIONSHIP TO TIME. WE DEAL WITH THAT UP FRONT. "I DON'T REALLY KNOW WHAT I WANT, HOW CAN I CREATE IT IF I DONT KNOW WHAT IT IS?" KNOWING WHAT YOU WANT, HOW YOU WANT YOUR LIFE TO BE, WHAT YOUR AMAZING LIFE LOOKS LIKE IS HALF THE BATTLE. THIS PROGRAM WILL HELP YOU TO EXPLORE WHAT THIS IS FOR YOU. WHEN HAVE A SENSE OF WHAT IT LOOKS LIKE, MAKING IT HAPPEN BECOMES JUST A SERIES OF STEPS TO TAKE. "I'M NOT SURE I AM THE KIND OF PERSON WHO CAN MAKE BIG CHANGES IN MY LIFE"
THIS PROGRAM ADDRESS THE EXTERNAL AND THE INTERNAL BARRIERS WE CREATE FOR OURSELVES. FEAR, LACK OF SELF BELIEF, LACK OF CONFIDENCE. WHEN WE UNDERSTAND THESE MORE, THEY BECOME LESS OF A BARRIER. THIS PROGRAM WILL HELP YOU DEAL WITH THIS ONCE AND FOR ALL. "CAN I SPLIT IT INTO TWO PAYMENTS??" "WHAT IF I DON'T GET THE RESULTS I WANT?" THIS IS A GROUP COACHING PROGRAM AND COACHING IS A TWO WAY PROCESS. I COMMIT TO SHOWING UP 100%. YOU WILL GET OUT WHAT YOU PUT IN. IF YOU SHOW UP 100%, COMMIT TO THE PROCESS AND DO ALL THE EXERCISES, YOU WILL ENSURE YOU GET YOUR MONEY'S WORTH. IF YOU COMPLETE THE COURSE, INCLUDING ALL THE EXERCISES, AND YOU FEEL IT WAS A WASTE OF MONEY, I WILL REFUND YOU YOUR FULL INVESTMENT WITHOUT QUESTION. "The coaching has really helped me with my direction and approach to life and work. I have enjoyed gaining new understanding on how the mind works. The results in this case more than justify the time and money spent, and working together was a pleasure, so I highly recommend working with Nathaniel." I highly recommend you contact Nathaniel if you want to understand more about yourself, learn how to face your fears or really enhance your experience of life. I am amazed at the results I've been able to get while being coached by Nath and consider him an essential part of me being able to achieve my potential. 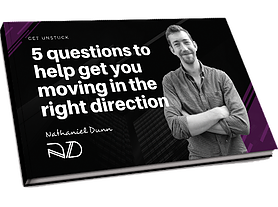 Nathaniel is fantastic at listening and uncovering what it is that you really want from your life. Our daily life struggles cloud our dreams and aspirations and stepping back to talk and work with Nathaniel helped me understand what it is I really want and what it is that I know will make me happy. Fear is something that holds us back from taking bold steps that we know will enhance our lives and Nathaniel is great at working through this. Nath is a great listener - he listened to the language I was using and used some great probing questions to really get behind what my big fears and challenges were. I came away from the call feeling much clearer, reassured and calm. I am making the right decision for myself!